Division of Plastic and Reconstructive Surgery, Keck School of Medicine of USC, Los Angeles, California, USA. While amputation was traditionally the only option available for patients with sarcomas of the extremities, chemotherapy, radiation, and advances in microsurgical technique have allowed many patients to undergo limb-salvaging procedures. Given the low incidence and heterogeneity of these tumors, there is currently no standard treatment algorithm for limb reconstruction after large sarcoma resection. Thus, we systematically reviewed the various types of free tissue transfer used for the reconstruction of lower limbs after sarcoma resection. Techniques were described based on anatomic location. This literature review supports free tissue transfer as a safe and acceptable modality for reconstruction after sarcoma resection of the lower limb. It allows for the application of healthy vascularized tissue to the defect while also providing freedom of flap positioning. Flap choice is dependent on tumor and defect size, tissue type and function, as well as donor site availability. Aim: Propeller flaps provide excellent reconstructive options for defects of many etiologies. Trunk wounds are a commonly encountered issue for the plastic surgeon and multiple techniques to address them should be prepared for implementation. Propeller flaps are a subject rarely brought up as an option to address these wounds. The authors sought to elucidate this topic in the current plastic surgery literature available. Methods: A PubMed search was conducted based upon the defined inclusion and exclusion criteria and publications reviewed in detail. Search terms included "trunk wound propeller flap", "trunk propeller flap", and "freestyle trunk wound flap". Duplicate studies were excluded. Data was extracted from each study pertaining to trunk wounds and reconstructions with propeller flaps. Results: The electronic search yielded 49 results with 21 studies ultimately meeting inclusion criteria. A total of 365 flaps were described collectively amongst the included studies. Among them, 190 propeller flaps addressing trunk defects were performed across all studies reviewed to address a total of 165 defects of the trunk: 14 abdomen, 101 back, 50 chest defects and adjacent respective flaps were utilized for surgical reconstruction. Overall, cancer excision wounds were by far the most prevalent with 105 cases (59.0%). Defect sizes of those specified in the articles ranged from 2 cm × 5 cm to 30 cm × 24 cm. Of the 190 propeller flaps identified, 63 total complications were identified. The most common complication was 48 total cases of transient venous congestion (25.3%). The second most common complication was partial flap necrosis (6.3%). No total flap loss was noted. There were 2 cases of seroma (1.1%) and 1 case of wound breakdown (0.5%). Conclusion: Propeller flaps are a viable reconstructive option for trunk wounds and should be in the armamentarium of plastic and reconstructive surgeons. Few studies are available in the literature regarding propeller flap reconstruction in trunk wounds. More aggregate data is needed in order to further review, evaluate, and refine propeller flap techniques and results. Periarticular reconstruction of appendicular bones in skeletally immature patients after tumor resection is a surgical challenge that requires a multidisciplinary approach. The authors present a case of Ewing sarcoma of the proximal femur in an 8-year old girl treated with wide resection of the primary tumor and reconstruction using a vascularized fibula epiphyseal autograft within a cadaveric femoral allograft. The native femoral head was preserved to restore articular anatomy. Postoperative course was without complications. 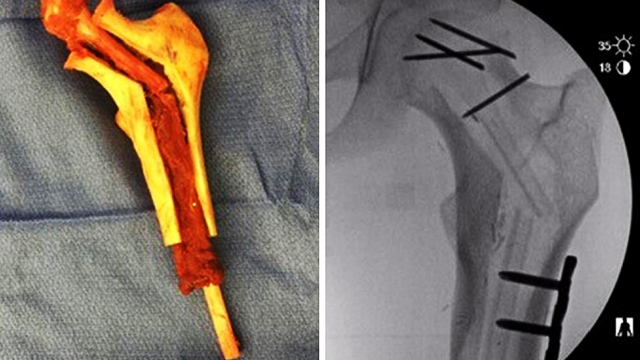 This report demonstrates the use of a vascularized fibula autograft within a cadaveric femoral allograft to optimize growth potential and joint durability in a pediatric patient. 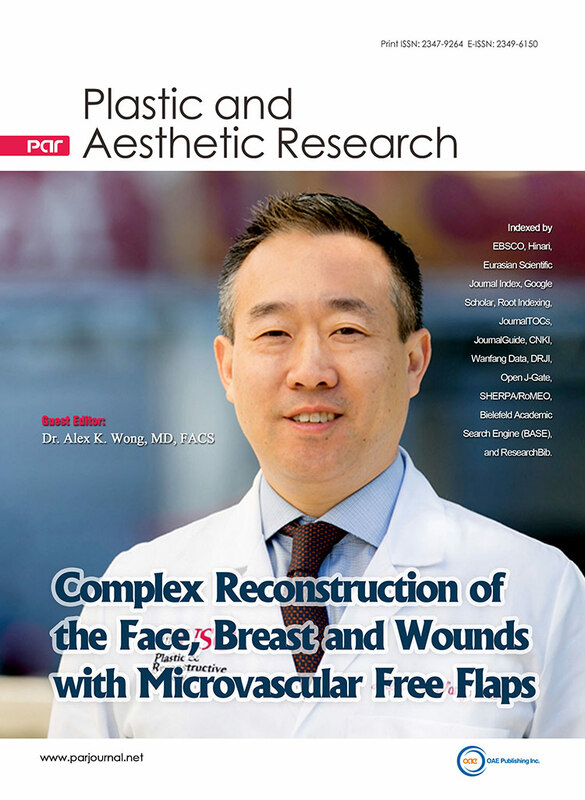 Aim: Autologous tissue transfer to salvage breast reconstruction following a previously failed or unsatisfactory reconstruction has been described by previous studies to be an effective strategy to optimize outcomes. The purpose of this systematic review is to assimilate the relevant literature to evaluate surgical and aesthetic outcomes following autologous breast reconstruction in the setting of a prior unsuccessful reconstruction. Methods: A systematic review of the English literature was performed on Pubmed/MEDLINE to identify all manuscripts reporting surgical outcomes, aesthetic outcomes, or patient satisfaction of autologous breast reconstruction in the setting of a previously failed or unsatisfactory breast reconstruction. Results: Nineteen studies met the criteria for inclusion. Of these, 15 studies reported outcomes following autologous conversion of unsuccessful prosthetic reconstruction (778 breasts). Pooled-analysis of these studies demonstrated total flap loss in 1.6%, microsurgical revision in 3.2%, total complications in 21.7%, and revision surgery in 26.5%. Review of these studies demonstrated high rates of positive aesthetic outcomes and patient satisfaction. Five studies (54 patients) evaluated outcomes following autologous salvage of prior unsuccessful autologous breast reconstruction. Pooled-analysis of these studies demonstrated no instances of microsurgical revision, total complications in 42.2%, and revision surgery in 70.0%. Total flap failure following tertiary reconstruction utilizing microsurgical free flaps occurred in 9.5%. Data describing aesthetic outcomes or patient satisfaction was lacking in these studies. Conclusion: Autologous conversion in the setting of unsuccessful prosthetic breast reconstruction appears to be valuable option to improve outcomes. There is little evidence to suggest that prior prosthetic reconstruction negatively impacts outcomes of autologous breast reconstruction. Data describing autologous breast reconstruction following prior flap loss is limited but suggests it is viable method to salvage breast reconstruction in appropriate patients.